After the fall of the Soviet Union, former U.S. president and one-time Cold Warrior Richard Nixon devoted the last few remaining years of his life to ensuring that Russia found its proper place in the international community. Nixon advised then-president Bill Clinton on the proper way to deal with the Russian Federation, the internationally-recognized successor state to the Union of Soviet Socialist Republics. One thing that Nixon would have never tolerated was the current neo-conservative penchant to deny Russia’s major role in World War II’s – known in Russia as the Great Patriotic War – victory of the Allies over Nazi Germany. Today’s leaders of the United States and their fellow-travelers in Britain, eastern Europe, and other countries would, therefore, find themselves being berated by Nixon over their failure to participate in the annual May 9 Victory Day ceremony held in Moscow. Nixon, who criticized the George H. W. Bush administration for providing “pathetically inadequate» assistance to Russia following the collapse of the Soviet Union, would have had little time for those in American policymaking circles who now want to financially emaciate Russia and bring it to its knees. Among those who are pushing for increased sanctions on Russia and ignoring its significant role in winning World War II are the sons and daughters of fascist and Nazi Eastern European emigrés who arrived in the United States in the years following the war, mostly via the Central Intelligence Agency’s «Operation Paperclip», to escape trials for supporting the Nazi cause in their homelands. These emigrés helped form various right-wing groups that orbited around the «Captive Nations» supra-organization that was enabled by those in the Eisenhower and succeeding administrations. Out of this constellation of fascist organizations arose the Ukrainian-American Zionist Lev Dobriansky and his daughter, former George W. Bush State Department official, Paula Dobriansky, along with the one-time supporter of the German Gestapo in Hungary, Gyorgy Schwartz, who later called himself «George Soros.» Their ideological progeny can today be found in governments throughout eastern and central Europe. Groups centered around the emigré circles in the United States, for example, the Heritage Foundation, the American Enterprise Institute (AEI), and the Brookings Institution, as well as the Soros-funded Human Rights Watch, that are pushing for a re-writing of postwar history. It appears that many of these neocon and historical revisionist groups would rather mark the defeat of Nazi puppet regimes in the Baltic countries, Ukraine, Belarussia, and Bessarabia in sorrow than recognize the Soviet victory over Nazism in celebration. Puppets of the North Atlantic Treaty Organization (NATO) in various central and eastern European countries are involved in a propaganda war against Russia aimed at ensuring that the May 9 celebration in Moscow has little official international participation. The effects of this propaganda war can be seen in the recent statement by Czech General Andor Šándor, the head of Czech military intelligence who retired in 2002, bemoaning large-scale Russian «spying» in Prague. This story was leaked in order to apply further political pressure on Czech President Milos Zeman, who has said he will bolt from a purported NATO «consensus» on avoiding the May 9 celebration, and fly to Moscow. The Czech opposition has already announced that it will try to de-fund in parliament Zeman’s trip to Moscow. Prague is, by nature, a flash point in Russia’s relations with the West. The Czech Republic still refuses to allow NATO troops to be based on its soil, even though Prague continues to host such anti-Russian activities as Radio Free Europe/Radio Liberty and various Soros-backed nongovernmental organizations (NGOs). Soros interlocutors in the European Parliament are also pressuring Serbian president Tomislav Nikolic to cancel plans to go to Moscow or risk Serbian membership in the EU. Three former U.S. ambassadors to Ukraine, Steven Pifer, John Herbst, and William Taylor, have outrageously urged Western leaders like Britain’s Prime Minster David Cameron, French President Francois Hollande, and German Chancellor Angela Merkel (who will reportedly fly to Moscow on May 10 for a wreath laying ceremony), who have announced their decision to boycott the May 9 ceremony and military parade in Moscow, to attend a Victory in Europe Day ceremony in Kiev. These «three stooges» of American «diplomacy» wrote in an op-ed for the Los Angeles Times that «even though Presidents Clinton and George W. Bush traveled to Moscow in 1995 and 2005 for other V-E Day anniversaries», President Barack Obama should celebrate the event not in Moscow but in Kiev. The ambassadors refuse to recognize that were Western leaders to observe such an event in Kiev, they would be standing alongside neo-Nazis and paleo-Nazis of every stripe, including supporters of Adolf Hitler and the Ukrainian Nazi leader and German SS enabler, Stepan Bandera. Pifer, Herbst, and Taylor are hardly alone in calling for the sacrifice of 27 million Soviet citizens in World War II to be marked in a city where neo-Nazis and skinhead mercenaries from around Europe enjoy political and military power. Pifer works for the Brookings Institution, a major center of current anti-Russian agitprop, while Herbst was a chief facilitator of U.S. Agency for International Development/CIA support for the Orange Revolution in Kiev and the development of pro-Western mass media in Ukraine. Taylor, as the chief coordinator of U.S. government assistance to the former Soviet Union and Eastern Europe, worked closely with the Soros organization and the National Endowment for Democracy (NED) to channel funds to pro-U.S. right-wing groups in the region. While Obama and his friends in NATO will not be in Moscow, Greece’s Prime Minister Alexis Tsipras, who has demanded war reparations from Germany for his country, will buck the NATO boycott and join Zeman in attending the ceremony on Red Square. The leaders of Iceland, Norway, Netherlands, Slovakia, and Hungary may also bolt NATO ranks and fly to Moscow for the May 9 ceremony. In what can only be considered a diplomatic slap at the Kiev regime and its Western supporters, the leaders of the eastern Ukrainian people’s republics of Donetsk and Lugansk in eastern Ukraine will be in the same Red Square viewing stand as the leaders from some 30 other countries, including China, India, Serbia, Macedonia, Bosnia-Herzegovina, the Serbian Republic of Bosnia-Herzegovina, Montenegro, Egypt, and South Africa, a fact that will confer a semblance of de facto international recognition of their status. In addition, the leaders of the republics of South Ossetia and Abkhazia will also reportedly be present, constituting a diplomatic defeat for the authorities in Georgia who view the republics as integral parts of their state. Meanwhile, while calling for a boycott of Moscow’s May 9 VE Day event, the leaders of the Baltic nations play host to various Nazi commemorations in their capitals. Lithuania’s President Dalia Grybauskaitė, a graduate of the Georgetown University Foreign Service School in Washington, a favorite CIA recruiting ground, does nothing to prevent annual observances at the gravesite of Lithuanian Nazi puppet leader and concentration camp builder Juozas Ambrazevicius Brazaitis, whose body was repatriated a few years ago from Putnam, Connecticut to Lithuania and reburied in Kaunas with full military honors. Estonia’s President Toomas Hendrik Ilves, a former head of the Estonian desk for the CIA-financed Radio Free Europe, was supportive of the Estonian government’s decision in 2007 to remove a Soviet victory statue Tallinn to a military base on the city’s outskirts where it now sits quite close to NATO’s cyber-warfare center. As Latvia’s leaders were joining their Baltic counterparts in championing a NATO boycott of the Moscow event, veterans and supporters of the Latvia Legion, commanded by the German Waffen SS Division during the war, recently paraded proudly through the streets of Riga in an event staged annually since 1991. 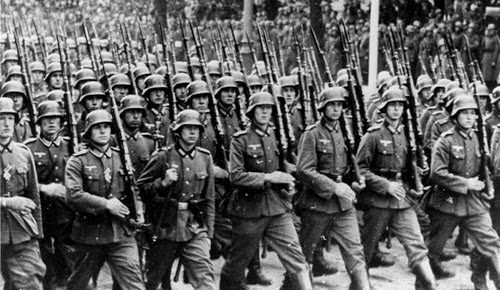 Latvian President Andris Bērziņš has done nothing to thwart the Nazi ceremony in Latvia although he finds it abhorrent that any Western leader would join Russia’s leadership in Moscow to mark VE Day over Hitler. Bērziņš has long been associated with the «Stockholms Enskilda Bank», owned by the Swedish Wallenberg family and accused of collaborating during the war with Nazi Germany, earning it a spot on a blockade list of the U.S. government. Poland’s European Council president Donald Tusk and Polish president Bronislaw Komorowski have joined their Baltic friends in trying to write Russia from the history of World War II. Polish foreign minister Grzegorz Schetyna attempted to re-write history by claiming Ukrainians, not Russians, liberated Auschwitz. Russia’s Foreign Ministry responded to Schetyna by stating, “It’s common knowledge that Auschwitz was liberated by the Red Army, in which all nationalities heroically served,” adding that Poland was making a “mockery” of history. Making a mockery of history is exactly what NATO leaders are doing by pressuring leaders of countries from South Korea and Japan to Bulgaria and Austria not to send official representatives to Moscow. The action is very reminiscent of the U.S.-led and diplomatically-immature boycott of the 1980 Summer Olympics in Moscow, a move deemed to have done more long-term harm to the Olympic movement than short-term damage to the USSR.